Cal Origami was founded in the Spring of 2009 by President Christopher Itoh as he was teaching origami at a nearby middle school in Fresno, California. After witnessing the effectiveness of his work in inducing a calm mood for a usually hyperactive class, he worked with his peers to establish Cal Origami at U.C. Berkeley in order to continue helping other students with stress. Cal Origami is a novel organization that not only focuses on the aesthetic qualities of origami, but also uses origami to reach out to local communities and teach practical applications. Studies have shown that Origami can be used as a therapeutic device to lower stress levels and reduce Attention Deficit Hyperactivity Disorder (ADHD) and Bipolar disorder. In addition, the theories and technicality of origami can be an effective teaching method for abstract concepts in arithmetic and geometry. 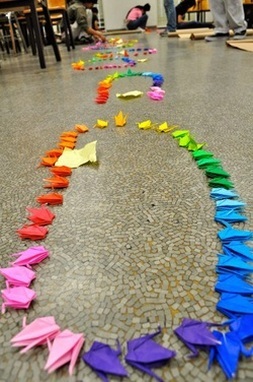 Within a year, Cal Origami has been recognized all over campus for its talent and dedication to spreading origami. We have participated in numerous events: Cultural Immersion Night hosted by the International Students Association at Berkeley, Matsuri hosted by Nikkei Student Union, and Fall Affairs, hosted by the Berkeley Art Museum. Next semester, we hope to reach out to the community by creating a program to supplement mathematics curriculum at local schools using origami. We hope that seeing ordinary shapes combined into extraordinary art forms will inspire the children and fill them with a sense of intellectual curiosity.